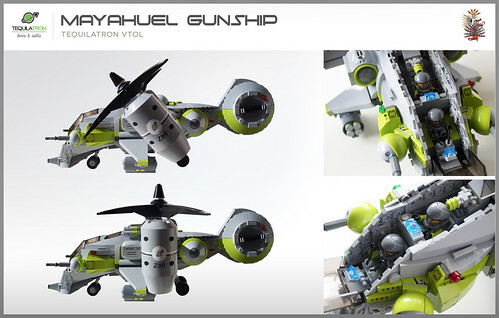 Mayahuel Gunship, Tequilatron VTOL. DA2 category 8: helicopter. Built with tiltrotors, retractable landing gear, crew of two, opening cockpit and mounted guns. 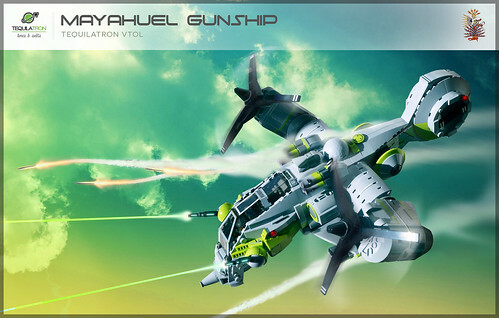 The Mayahuel Gunship, also nicknamed 'Sky Dominator' is a tactical and weapons-packed helicopter capable of traveling long distances due to it's tiltrotor system. Inspired by the V22 Osprey and the Apache helicopter, this hybrid was developed to support and coordinate the Tequilatron war effort from above. Its name is derived from the Aztec female goddess of booze. Nuff said. 1. 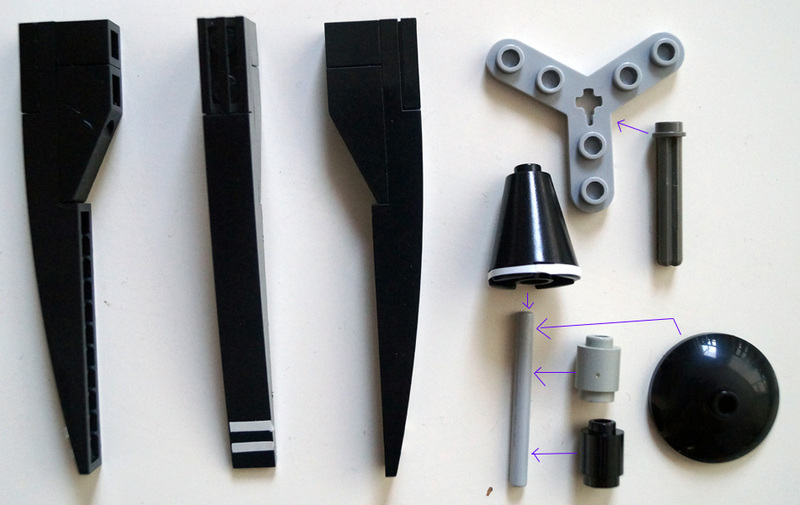 Your Helicopter MOC must be minifig scale. 2. Your Helicopter MOC must include a minimum crew of two, with a designated Pilot and co-pilot. 3. Your Helicopter MOC must be shown resting on the ground on landing gear or landing skids. 4. Your Helicopter MOC must have at least one mounted weapon of any type. 5. Your Helicopter MOC must have a minimum of two rotors. Your support keeps the tequila flowing! Quoting The Northern Imperial AKA - Lord Bacca. This could be my favorite so far, great design and build. This could be my favorite so far, great design and build. Quoting Dario Dipic Love the shape and colors. Great work! Love the shape and colors. Great work! Quoting Marc dZ OMG!! Pico, I'm totally fan of your style. This is one is smashing again! The design is very dynamic and novative. Smooth lines, studless. Complex technics. Stunning work!! OMG!! Pico, I'm totally fan of your style. This is one is smashing again! The design is very dynamic and novative. Smooth lines, studless. Complex technics. Stunning work!! Sounds like the whole shabang to me! Thanks a lot Matt! Quoting Matt G-ria Incredible as usual. Wildly imaginative. Great angles, details, and techniques. Well I needed some beefy border patrol with all the kegs of tequila disappearing lately ;) Haha, thanks David! Quoting David Roberts A n impressive and heavily armoured looking machine. I think that this is because of all of the curved parts that you've used. It also has quite a smooth appearance. I like the curve of its nose and the cockpit it contains, plus it has a proper, wheeled landing gear. Great build and presentation too. Incredible as usual. Wildly imaginative. Great angles, details, and techniques. A n impressive and heavily armoured looking machine. I think that this is because of all of the curved parts that you've used. It also has quite a smooth appearance. I like the curve of its nose and the cockpit it contains, plus it has a proper, wheeled landing gear. Great build and presentation too. Thanks for commenting and letting yourself get known, your builds and remakes are superb. Quoting Nerds forprez Awesome build and awesome pics to boot! Hey, you're on here too? Nah I'm kidding, you were one of my favs already :D Glad you added me of course and thanks for the support. Stay tuned for more freshly served tequila! Cheers Stuart! Can't wait to see your choppa! Quoting Stuart Lucas Absolute beauty! I love the tilt rotors and all the curves... this is another fantastic build. Well done! Quoting Didier B Suberb ! The cockpit in particular is a real success. Quoting Sean B Beautiful build. Keep up the good work. Absolute beauty! I love the tilt rotors and all the curves... this is another fantastic build. Well done! Suberb ! The cockpit in particular is a real success. Beautiful build. Keep up the good work. Do they fly it drunk?! I love it! How did you build the rotors? Thanks for the image Pico I didn't know they made a three legged piece like that. Amazing work! May I ask, were you inspired at all by the Fallout Vertabird in any way? Yikes! It makes me want to swoosh it about making noises. Another high-powered death machine from Tequilatron. General, you are specification-accurate and ready to paint the map with lime. Awesome build and awesome pics to boot! Haha thanks Clayton, that is a wonderful compliment to get :) I'm glad you enjoyed and happily skipped 50 e-mails for it. I on my part enjoy reading all your comments. Cheers for supporting! Quoting Clayton Marchetti I absolutely love this! I jumped over 50 emails to check this out when I saw it on the front page. I think this is my favorite build in DA2! I love the whole concept. The ospreys tilt rotor and the Apache's body and a whole lot of weapons! I love the props by the way. Awesome cockpit to. Magnificent outstanding work Sir! I salute you. With such incredible builds like this, Tequilla will undoubtedly flow through every territory. Amazing presentation. Good luck in Turn 3. Thanks Tim! What once started as an innocent CSPMC build has evolved into this line of tactical equipment ;) Glad you dig it! Quoting Tim C Good stuff again, Pico. Love that cockpit. I like this bright green, lt bley combo you have going here. I also like the double prop. Awesome! Nice work. I absolutely love this! I jumped over 50 emails to check this out when I saw it on the front page. I think this is my favorite build in DA2! I love the whole concept. The ospreys tilt rotor and the Apache's body and a whole lot of weapons! I love the props by the way. Awesome cockpit to. Magnificent outstanding work Sir! I salute you. Good stuff again, Pico. Love that cockpit. I like this bright green, lt bley combo you have going here. I also like the double prop. Awesome! Nice work. Quoting Tirrell Brown Thanks for the image Pico I didn't know they made a three legged piece like that. Might I suggest a few shots of good ol' tequila to fuel the creative mind? You can have some of those lime parts with it if you want to! No I'm not trying to sabotage you ;) Thanks for your support general Remy, the respect is mutual. Can't wait to see your take on the category, keep calm and brick on. Thanks mr Cruzen! That mind has been quite active since the start of DA2 [http://mocpages.com/group_mocs.php?id=25171] ! So many ideas sketched and bricked, it's a fantastic run :D I'm glad you're liking the bits that come alive. 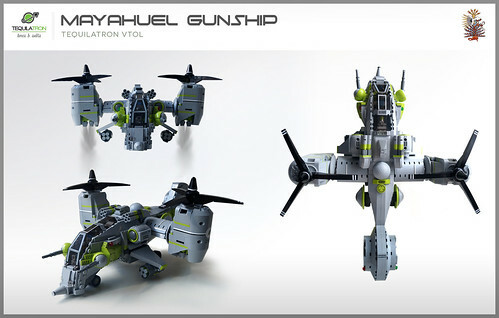 Quoting Oran Cruzen A great work of Lego "Gunship" creationism from you! Such wonderful imagination in that mind of yours! 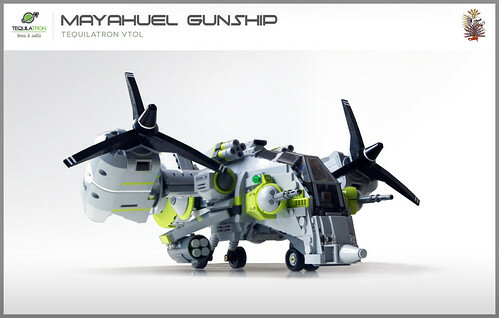 A great work of Lego "Gunship" creationism from you! Such wonderful imagination in that mind of yours! Quoting Henrik Jensen WOW! This Tiltrotor helicopter is an excellent addition to your airforce! Congratulations on the blogpost! Quoting Nick Barrett You are ruling the skies Pico! Awesome chopper. Quoting El Barto ! Awesome! You are ruling the skies Pico! Awesome chopper. WOW! This Tiltrotor helicopter is an excellent addition to your airforce! Congratulations on the blogpost! Thanks Spencer, DA2 stands for Decisive Action II, here's the group: http://mocpages.com/group.php/25171 It's a MOC based game of conquest. You should check it out! Quoting Spencer A Awsome gunship! what does da2 mean? Thanks Ian :) Ditto to you! Quoting Ian ... That's awesome! Good luck in the coming combat! Quoting Tirrell Brown Do they fly it drunk?! I love it! How did you build the rotors? 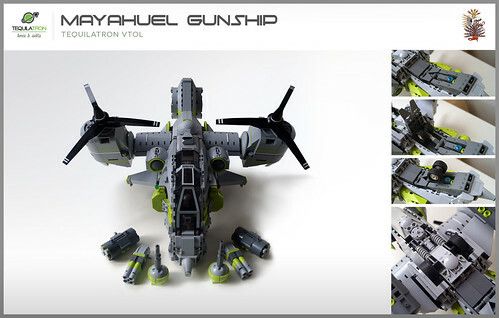 Awsome gunship! what does da2 mean? That's awesome! Good luck in the coming combat! Haha probably :D I'll take an assembly pic this evening and post a link for the rotors. Thanks for the support fellow general! Quoting Mihe Stonee great! and now tell me where did you buy this cool series :-) ! the question really should be - do you dismantel all the other lime builts or do you have a flaterate on Bricklink :-) ?? I spend my nightly hours on builds like these with a smile on my face. Thanks Marc! great! and now tell me where did you buy this cool series :-) ! the question really should be - do you dismantel all the other lime builts or do you have a flaterate on Bricklink :-) ?? Coming right up, thank you for fueling the war effort ! Thanks Allan! Glad you like it :) Although lime green is not per se the number 1 intimidating color, I hope it's overall look compensates :D I might rework this into a military variant after DA2. Camo colours and stuff..
Haha I just made a new BL order to compensate ;) I'll tell you, my seller is a happy man these days! I did have to dismantle the airship though. The tank, fighter, marines, walker and powersuit still stand nicely grouped on the shelf. There is a tailrotor, but it's top secret and therefore hidden in shadows.. *cough*. Thanks buddy! Quoting Stephan Niehoff So, you will soon have no more parts. AHA, it looks to me as if you have dismantled some of your Moc's here. Or do you have a new supply of bricks come by. 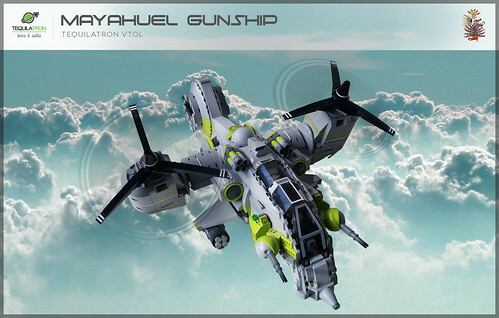 In any case, this Gunship has become very beautiful. I like the cockpit and the rotors. At the rear, I can not really see a rotor. But I think there is one, right? This masterpiece of you shows the attention to detail you work. Simply brilliant my friend. Haha me too and it has occured more than once :D Kids want to as well, but I'll not let them crash this baby yet. Thanks chief, and I'll take the no-nonsense approach in to account for my upcoming builds. I've just read the rules update thread, this affects my apporach to presentation as well. Quoting Keith Goldman Yikes! It makes me want to swoosh it about making noises. Another high-powered death machine from Tequilatron. General, you are specification-accurate and ready to paint the map with lime. Thanks Quinn. A bit, I actually sticked more to the Osprey and Apache rather than the Vertibird. The Vertibird has a more bulky and sinister front look. It is however one of my favorite games and I am totally waiting for november when Fallout 4 is due! Quoting Quinn Beeson Amazing work! May I ask, were you inspired at all by the Fallout Vertabird in any way? Quoting Damon Corso WOW! amazing tequilatron work once again Pico! the tilting rotors are top notch, and i really dig how you hid the landing gear on the bottom of the chopper. Great stuff here! So, you will soon have no more parts. AHA, it looks to me as if you have dismantled some of your Moc's here. Or do you have a new supply of bricks come by. 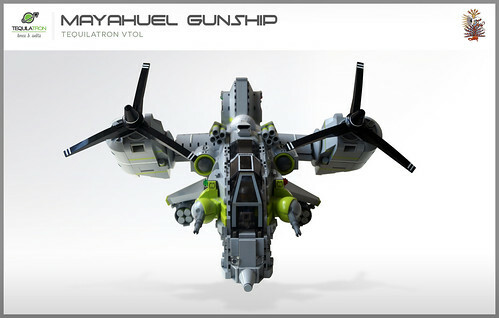 In any case, this Gunship has become very beautiful. I like the cockpit and the rotors. At the rear, I can not really see a rotor. But I think there is one, right? This masterpiece of you shows the attention to detail you work. Simply brilliant my friend. WOW! amazing tequilatron work once again Pico! the tilting rotors are top notch, and i really dig how you hid the landing gear on the bottom of the chopper. Great stuff here!